Purchase $25 worth of Braum’s Fresh Market grocery items including: Braum’s Milk (all varieties), Braum’s Ice Cream (all varieties), Braum’s Dairy Products including Butter, Cottage Cheese, Sour Cream, and other Braum’s Dairy related products, Braum’s Juices, Braum’s Brands (all varieties), Braum’s Meats, other Braum’s Frozen Products, Braum’s Fresh Market Produce, and all other Braum’s Fresh Market Products including related grocery items not under the Braum’s label but purchased in Braum’s Fresh Market are all included in the Free Braum’s AnAffair of the Heart Ticket Promotion. Braum’s Restaurant and Fast Food Menu items are not included. Circled register receipt(s) totaling at least $25 (twenty-five dollars) for each ticket requested and dated within the date ranges required for the show ticket you're requesting. You must show proof of purchase (YOUR ORIGINAL RECEIPT, NO PHOTOCOPIES OF RECEIPTS WILL BE ACCEPTED) of at least $25 worth of qualifying products for EACH ticket purchased. Maximum allowable is $50 worth of qualifying products for up to two tickets per household, family or address. We will make every attempt to redeem any requests received after the post marked date for each promotion period, but we cannot guarantee receipt by showtime. Although every effort will be made to return tickets right up to the date of the show, please allow reasonable time for delivery. Also, we will accept only original receipts, no copies. There may be other restrictions or requirements as printed on each promotional-time-period tearpad available during promotional dates in participating Braum’s stores. No post office boxes. 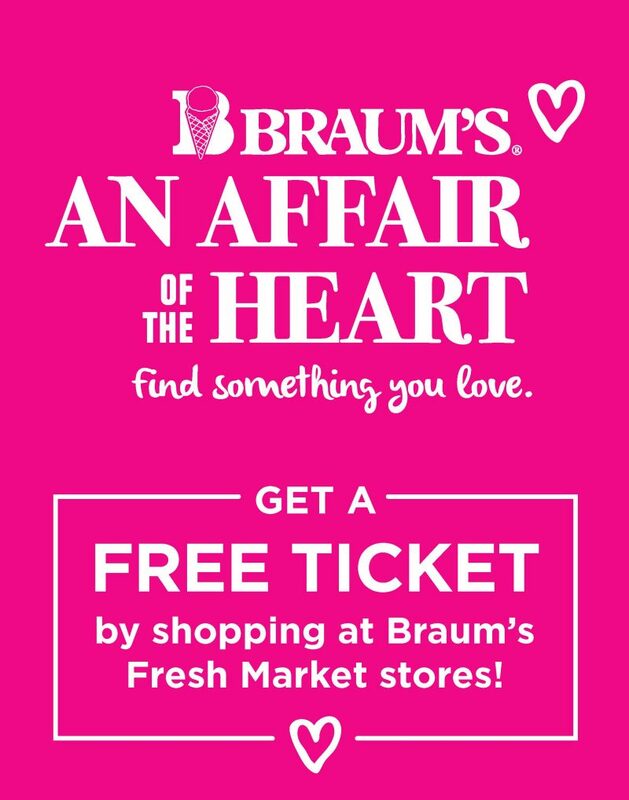 Braum’s, AWG, their vendors or suppliers, and An Affair of the Heart assume no responsibility for lost, damaged, misdirected, incomplete or illegible redemptions and/or redemptions received after one week prior to the event. All redemption requests must include a self-addressed, STAMPED envelope for ticket(s) to be returned along with a phone or email address for use in case of an issue with redemption.